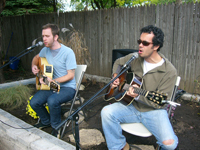 It’s always good to look back at a wonderful performance at the 2009 Bryan House Garden Dedication. Bryan House remains the centerpiece of now multiple sites of Emmanuel House, a larger organization which helps disrupt cycles of poverty for hard-working American families through home ownership and higher education. Bryan House and Emmanuel House were both started as a living memorials to Bryan Emmanuel Guzman by Rick and Desiree Guzman. Read more about it Here, and join Emmanuel House’s mission, a mission now more important than ever, given the growing inequality in America today. One of the great supporters of Bryan House and Emmanuel House has been singer/songwriter Kevin Andrew Prchal, here with Dan Guzman in an impromptu—but so good!—rendition of his song “Peace Not War,” from his CD Eat Shirt and Tie. ♦ Go to the Emmanuel House/Bryan House main page. 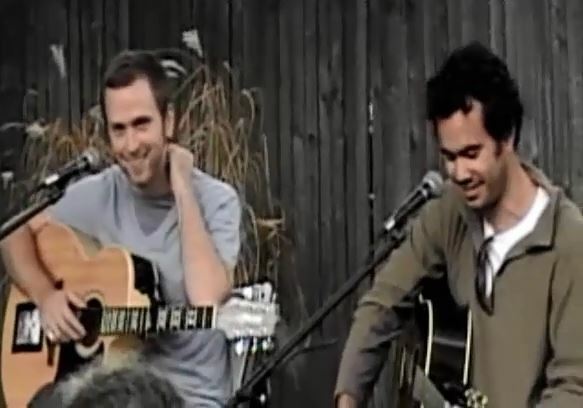 ♦ Hear “Hallelujah,” another song performed by Kevin and Dan at the Garden Dedication. This entry was posted in Music & Media Podcasts, Social Change and tagged Bryan E. Guzman, Bryan House, Dan Guzman, Emmanuel House, Kevin Andrew Prchal, Peace Not War. Bookmark the permalink.